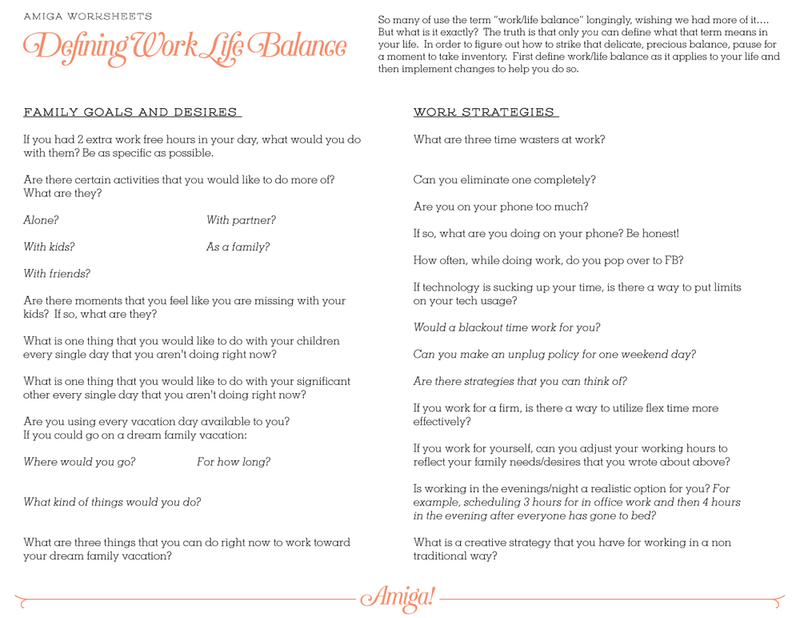 DEFINING WORK/LIFE BALANCE: A Worksheet for You! We all want "work/life balance." So many of us say the term longingly, wishing we had more of it…. But what is work/life balance exactly? The truth is that only YOU know what work/life balance means to you. In order to figure out how to strike that delicate, precious balance in your life, take a moment to take inventory so that you can first define work/life balance as it applies to your life and then implement changes to help you do so. Print it out, pull out a piece of paper and a pen or draw up a new Word document to type out your answers. This is an exercise that is best done in writing instead of just in your head. Be honest but gentle with yourself. This is a positive exercise to help implement empowering changes for you and your family. Take a moment to review all of your responses. What 3 actionable tasks can you put into place right now to maximize your goals of family time and make your work day more efficient? Be specific about this. For example, instead of saying, "Pick up my daughter from school more often," write "Pick up my daughter from school two times a week." Then schedule those two days on your calendar right now. If Facebook is a problem for you, then your task can be, "Check Facebook no more than 3 times a day at work for no more than 15 minutes each time." Then schedule those three times into your calendar, say at 10am, 1pm, and 4pm. Set a timer when you log on to hold yourself to it. We can transform our lives with very small, steady changes. Be kind to yourself. You are doing your best and every moment is an opportunity to do even better! Come back to your responses regularly and try to honor yourself and what you have written here. Do the exercise every other month or so to check in and reevaluate your goals and give yourself kudos on the changes you have made. We would love to hear your goals, strategies, and how you are doing. Let's start a conversation in the comments below!